The Charlotte region’s housing market ended the first month of the third quarter of 2018 with home prices up, closed sales down due to limited inventory, but with pending sales up as compared with July 2017. Both average and median sale prices were up in July 2018. Inventory and the months supply of homes remain low and below what they were one year ago with homes selling faster as a result. Inventory and months supply of homes continue to drop by double-digits. July 2018 Closed Sales: down 2.8% versus July 2017. Year-to-date, closed sales were down 1.0% (more to do with lack of inventory than diminished buyer interest). July 2018 Pending Sales: up 12.5% versus July 2017 and up 1.5% year-to-date. July 2018 Average List Price: increased 4.5% to just over $308,000 versus July 2017. Year-to-date, average list prices are up 4.3% to just under $327,000. July 2018 Average Sale Prices: up 5.1% to just over $290,000 versus July 2017 and up 6.7% year-to-date to just under $288,000. Median Sale Price was also up 2.1% to $240,000 compared with July 2017 and up 6.3% year-to-date to $238,000. July 2018 Percent of Original List Price Received: flat compared with July 2017 at 97.2% and up 0.2% year-to-date to 97.2%. July 2018 Inventory of Homes for Sale: down 16.3% versus July 2017. July 2018 Months Supply of Homes for Sale: down 17.2% to 2.4 months. Charlotte region’s housing market continues to be very much a seller’s market, as it had been throughout 2017 and 2018 year-to-date, with parts of the Charlotte metro area having barely one month of inventory. The message for Charlotte region home buyers remains what it’s been since 2015 and isn’t likely to change very much in the foreseeable future as we fully enter the end of the 2018 spring selling season. The supply of homes available to buy remains very tight and those that are on the market are selling more quickly with minimal negotiating room. In prime neighborhoods, we continue to see many homes going into contract within days of listing. Home buyers continue to have fewer options to choose from and need to make decisions and offers more quickly than ever. 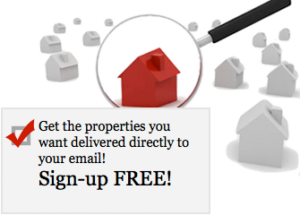 With homes receiving multiple offers, buyers also need to make “clean” offers with a minimum of contingencies. As the chart below shows, in the $100,000-200,000 price points, the months supply of homes is hovering at barely one month. 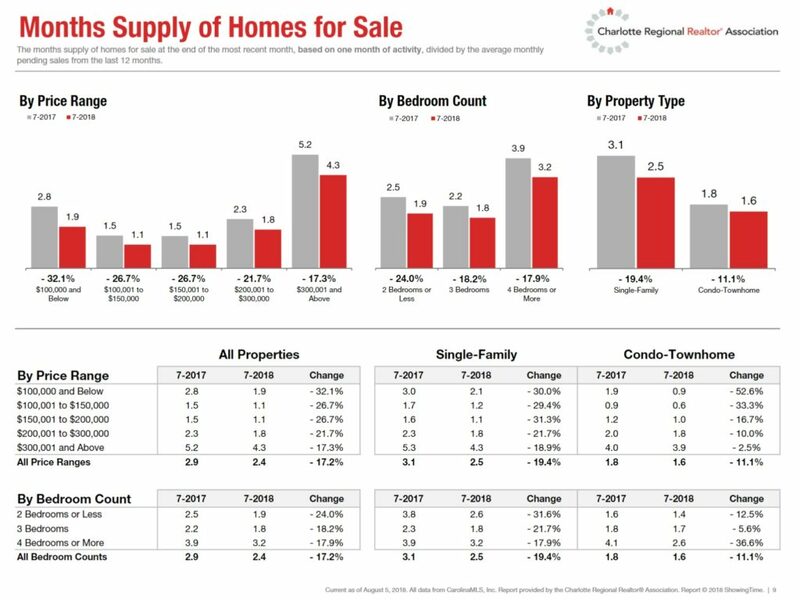 Supply of condos and town homes is even tighter at less than one month of inventory. Home prices are continuing a steady increase and housing affordability continues to decrease. Buyers must be prepared to pay more for a home and to expect to negotiate less off the asking price. Depending where in the Charlotte metro area buyers are looking, they may not be able to negotiate at all and should expect multiple offers that drive the final sale price above asking price. For buyers looking for homes priced under $300,000, and especially under $200,000, the selection is very slim these days…. impacting the average prices of homes sold which continue to increase month after month throughout 2016 and 2017 and now in 2018. 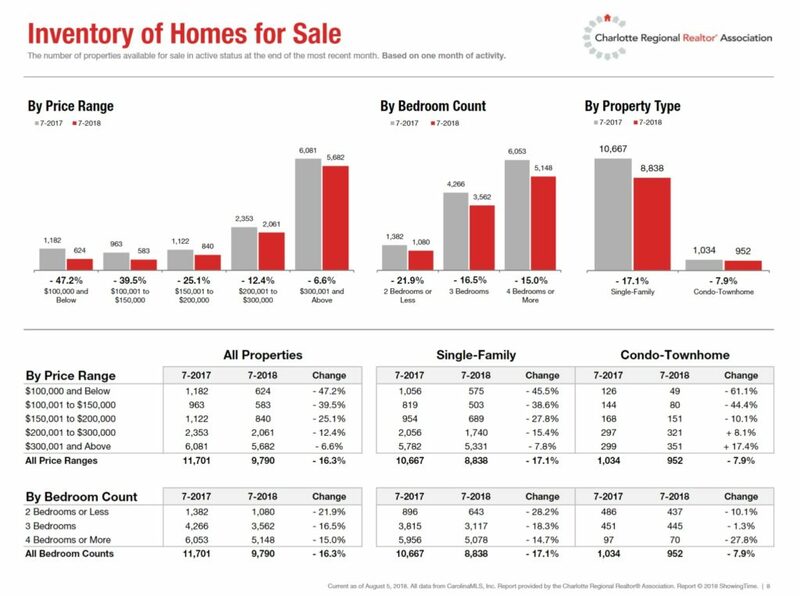 The graph below shows just how much less inventory there is in home priced under $200,000. With the housing affordability index down by 7.5% in July 2018, a strong argument can be made that home buyers should be making purchase decisions sooner rather than later, as affordability will most likely continue decreasing (and even more so as interest rates rise in 2018). First time home buyers, especially, are feeling the squeeze these days given the lack of affordable homes under $200,000 available for sale. When a home is priced right, staged right, and marketed right, it will sell and, on average, should sell in about five weeks. The days from list to closing in July 2018 were down 8.8% to 83 days compared with July 2017. Days on market till sale were down 14.3% to 36 days compared with July 2017. Cumulative days on market were down 14.3% to 42 days in July 2018 versus July 2017. Year-to-date, days on market and cumulative days on market were down 12.2% and 12.1%, respectively, compared with July 2017. Sellers who have been overly aggressive in pricing their homes are not seeing their homes sell quickly, if at all. Pricing is still key even in a strong seller’s market. With homes selling faster, sellers need to be prepared to move quickly and to have back-up plans for a new residence at the ready. This monthly Charlotte, NC region housing market update is brought to you by Nina Hollander and Carolinas Realty Partners, Coldwell Banker Residential Brokerage, your Charlotte metro area residential real estate experts serving Charlotte area home buyers and sellers for 20 years.